What are the minimum requirements for instream TV? RJ45 Cable to connect your instream TV player to your internet modem. HDMI cable to plug your instream TV player to the TV. What are the required network settings (Technician)? 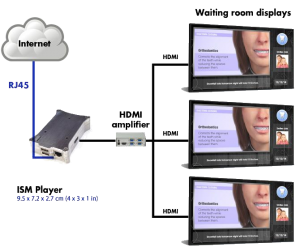 The instream TV player needs access to several servers on the Internet for configuration, management and video downloads. All communications are done through TCP port 443 and 80. Some other protocols are needed such as for DNS resolution (UDP/TCP port 53). However, the instream TV player will usually obtain those settings from your DHCP server and in typical network, you should probably not worry about that aspect. In most scenarios, it is likely that you are using dynamic addressing (DHCP). Just plugging your instream TV player to your TV, network and power should suffice for the system to come on-line. If this is not the case or if you are using static addressing, please contact us and we will be pleased to help you. How do I install instream TV? Connect your internet data cable (RJ-45 “Twisted Pair” connector) from your router/switch to the instream TV player. Connect an HDMI cable from your instream TV player (Output) to your display monitor (Input). Once the above steps are completed, please make sure that the Memory SD card is inserted correctly. Connect the Power cable (Included) from your instream TV player to your power outlet. Connect an HDMI cable from your instream TV player (Output) to an HDMI Amplifier (Input) (Not Included). Connect an HDMI cable from your HDMI Amplifier (Output) to each display monitor (Input). How do I turn the instream Player ON/OFF? There is no ON/OFF button on the instream TV player. If you want to turn it on, just plug the power supply in the DC-IN input and plug the other side in the electrical outlet on the wall. If you want to turn it OFF, simply take the cable out the electrical outlet. (To increase the instream TV player’s longevity, we recommend to use an uninterruptible Power Supply (UPS – not included). The instream TV player is configured to run 24 hours a day, you only have to turn your display/monitor OFF outside the clinic’s operating hours. How do I login to my instream Player? You should now be logged in to your instream TV Player and manage all the available content. To learn how to manage each available features please refer to our “How to manage the content?” section below. How to manage the content? Please refer to the Legend below for the content management. 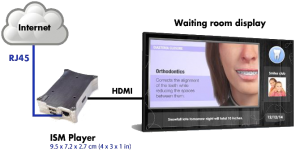 “Remove” button used to remove Dental Clips, Dynamic Clips, Ticker and Patient Zone information. “Edit” button used to edit “Dynamic Clips”. “ON/OFF” button used to turn “Dynamic Clips” On or Off. “Save Label” button used to save “Dynamic Clips”, “Patient Zone” and “Ticker” labels. How do I add Dental Clips? Once you’ve clicked on “Add” you can now manage the order in which the selected clips will be played by clicking on “Move Up” or “Move Down”, “Remove” a clip and or “Duplicate” a clip. How do I add Dynamic Clips? Make sure that the “ON/OFF” button is green to turn on the clip. Navigate to the “Dental Clips” section to verify if the order in which your recently added Dynamic Clip corresponds to your desired order. Click on “Remove” if you’d like to remove the information added in the above steps. How do I add MultiZone themes? You will now be using the selected theme. If you’d like to remove the message simply click on the “Remove” icon beside the message. Click on the dropdown menu and select an RSS feed you’d like to add. If you’d like to remove the RSS feed simply click on the “Remove” icon beside the feeds link. How do I add PatientZone content? Make sure that the “ON/OFF” button is green to turn on the recently added Patient Zone content. How do I add the updated information to my current content? The updated content should be displayed in about a minute or less depending on the player’s refresh timing.